Google Keep has been my favorite bookmarking and reminder tool ever since Evernote made their free plan worthless earlier this year. I use it on a daily basis to bookmark interesting links and to write notes to myself. One of the neat features of Google Keep is that you can set reminder alarms for your notes and bookmarks. Today, for the first time, I noticed that you can set those reminders based on location as well as time. To set location-based reminders in Google Keep you will need to have location services enabled on your phone. With location services enabled you can choose to have a location-based reminder alarm added to any of your notes. To do this, just tap the reminder option on your note then choose "place" and type in the location you wish to associate with your reminder. 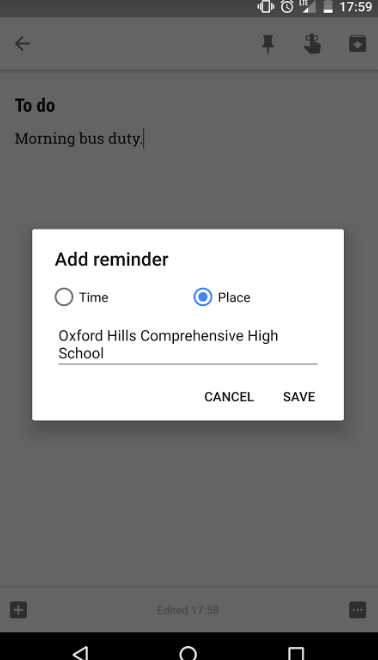 Google Keep's location-based reminders could be great for reminding students of meetings that they have after school. I can also see teachers using the feature to remind themselves of things like morning bus duty or lunch duty. Click here for ten other ways that students can use Google Keep.